Gwynneth completed her education, not with great academic qualifications, but with a calling from heaven to reach out to the homeless and rejected with the love of Jesus. She invested herself in spending time with, and praying for, the marginalised, but her efforts soon led to burnout, followed by a rapid download spiral emotionally and spiritually. She began to encounter Satanic activity, depression and sickness, along with abuse and rejection from those around her. At times she made poor choices. 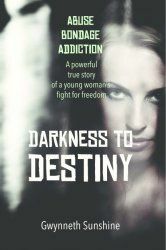 Gradually she found herself drawn into the world of drug addiction, with poverty, suffering and violence. 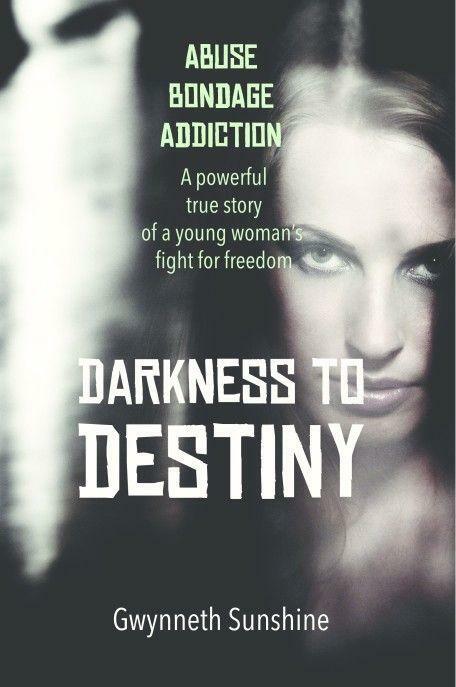 Darkness to Destiny is the autobiography of Gwynneth Sunshine and it is quite a story! Nobody ever said that living as a Christian would be easy. When we take a step of faith and commitment, we still face issues from our life previously, as well as new challenges that following the call of God brings. In school, other children bullied Gwynneth, yet she seemed to be blamed for the trouble. She lived for ballet and tried out for, and accepted into, a prestigious ballet school. While in this boarding school she describes some of her experiences, they include the normal things, talking about boys, midnight feasts, school meals, discipline and prefects. Some of the extra-curricular activities though were a bit more worrying as she questioned the reasons for being, which led her towards the supernatural including Ouija, levitation and automatic writing. She understood that there was a power here, but she did not understand it. At least not until one girl started talking to her about God and the Bible. Her experiences of a cold church on a Sunday morning did not exactly bring it to life, but she started to read books including “Run, Baby Run” and “The Cross and the Switchblade” and God started to become real to her. Eventually she became a Christian and along with some other girls, a mini-revival broke out in the boarding school. From there, she felt a call to reach out to people who have drug and mental health issues. When she finished school, she went to Bible college. After her time there, she started work in a café, where she is able to befriend some of the locals. She is quite forthright in her presentation of Jesus as the answer to problems, and suffers a bit of a backlash from other staff. It is at this point when her life starts to spiral out of control. Suffering from burnout from working in the café and trying to obey God’s plan leads to headaches and depression, eventually a dependency on cigarettes and medication followed. With her life out of control, she does not feel comfortable in her new world, but equally does not feel comfortable in the church world either. The change from the earnest young believer into this woman who no longer even recognises herself in the mirror is dramatic. The great thing about the Christian life and church is that we all come to faith in different ways. For Gwynneth she had powerful experiences of God in her life whilst in boarding school. These experiences, no doubt, kept her going in the tough times, at least enough to not give up on God completely – even when her life was spiralling out of control she has an understanding that this is not what she was born for, her purpose lay elsewhere. The journey back is difficult for her, but she tells it honestly. In the early parts of the book, Gwynneth comes across as very earnest. In her understanding and presentation of her story and her encounters, she is very forthright. For me it seemed that as an evangelist she lacked finesse to present the Gospel and her outlook on life is very insular. It put me off the book a little, but as I continued to read, I discovered that she treats those darker moments in the same way. There is a brutal honesty behind the words of this testimony; the writer wants to tell it with a warts-and-all approach. When finding life most difficult, she discovers that the church doesn’t have every answer, and even those that lead the church can go wrong and cause damage. Many on the fringes of church have faced this experience, and here this is presented from within the wondering of a very fragile mind. There are experiences here that we should take time use as a learning experience. I do have issues with some of the theology behind some of the incidents. Like, whether or not someone can be inhabited by an evil spirit whilst having the Holy Spirit dwell in them? Scholars and ministers have been discussing this for a long time. There are other Spiritual experiences that other people, depending on their outlook, may also take issue with as well. Despite the writing style, which may not be to everyone’s taste, this is a book that will move you and you will mentally walk far more than a mile in this lady’s shoes.